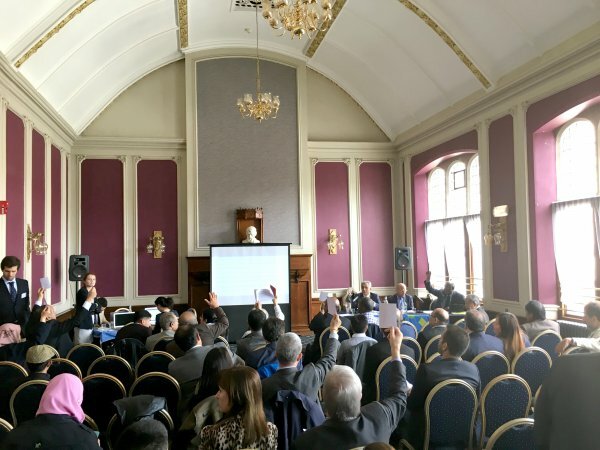 Last week [26-28 June], the Unrepresented Nations and Peoples Organisation (UNPO) held its XIII General Assembly in Edinburgh, Scotland. The UNPO’s General Assembly takes place every 18-24 months and is the organisation’s most important meeting, since all UNPO Members gather from all around the world to discuss the past and future activities and strategies of the organisation, in addition to electing the organisation’s board and President. The General Assembly was structured in three days of discussions and events. A total of twenty-four Members’ delegations coming from different continents around the globe who attended the assembly. Following the conference "Sharing Perspectives on the Rights of the Unrepresented on the Eve of UNPO's XIII General Assembly" organised in partnership with the Third Generation Project, a think tank of the University of St Andrews, MSP Willie Rennie also hosted the Opening of UNPO’s XIII General Assembly. The panel displayed inspiring interventions of UNPO's Secretary General Marino Busdachin; UNPO President Nasser Boladai; MEP Dr Josep-Maria Terricabras; and United Nations representative of the Nonviolent Radical Party (NVRP) Laura Harth. The high-level discussion covered topics such as the concrete implementation of human rights by the international community, the concepts of nation and identity, the difference between self-determination and independence and the use of the rule of raw in claiming the rights of the unrepresented within a nonviolent framework. The General Assembly convened and discussed some internal questions such as the membership fee. It then held the so called ‘’Flag Ceremony’’, during which new UNPO Members, respectively Chameria, the District of Columbia, Kabylia, Sindh, Southern Azerbaijan and Brittany exchanged their flags with UNPO‘s in celebration of their admission as Members. The Bellah people was also accepted as a new Member in May 2017 but was unfortunately not present at this session of the GA. After the open debate, the current UNPO Members presented the issues and human rights violations that their communities suffer through Members resolutions. Representatives of the Khmer Krom, East Turkestan, Chittagong Hill Tracts, Ogaden, Oromos, Tibet, Iranian Kurdistan, Ahwaz, Afrikaners, Chameria, District of Columbia, Sindh, Taiwan, Southern Mongolia and Sulu took the floor and gave voice to their concerns and hopes to tackle their Nations or Peoples’ oppression and discrimination. In the evening, a reception entitled "Self-Determination in the Globalised Age: Building Solidarity Among the Unrepresented" was hosted by MSP Joan McAlpine of the Scottish National Party (SNP). There were interventions by MSP McAlpine herself; Ms Rhiannon Spear, Scottish National Party (SNP) councillor for the Greater Pollok ward of Glasgow; Mr Erkin Alptekin, one of the founders of the UNPO representing East Turkestan; and Mr Abdirahman Mahdi, Foreign Relations Secretary of the Ogaden National Liberation Front (ONLF), Chair of the Ogaden People’s Rights Organisation (OPRO) and Vice-President of UNPO since 2015. Find out more about the event here. The final session of the UNPO XIII General Assembly saw the discussion and approval of a general resolution setting principles and guidelines to the executive body of the organisation for the next term. The declaration also stressed the fundamental values and objectives that each UNPO’s Members should pursue on their way towards recognition by the international community and a better respect of their rights. Following a discussion held by Members in January, amendments to the UNPO Covenant were unanimously approved. The Assembly closed its session with the re-confirmation of UNPO's Secretary General Marino Busdachin, Treasurer Jeroen Zandberg, President Nasser Boladai and Vice-President Abdirahman Mahdi. According to the reformed Covenant, a new Vice-president, World Uyghur Congress's Dolkun Isa was appointed as well. Besides, two Assistants to the General Secretary, Vrouw&Maatschappij’s Maud Vanwalleghem and NVRP’s Laura Harth and a Special Envoy on Freedom of Religion, Ahwaz Human Rights Organisation - AHRO منظمة حقوق الانسان الأهوازية's Mona Silavi, have been appointed to support the Secretariat as external experts. Lastly, Presidency Members were chosen: Taiwan, Tibet, Iranian Kurdistan, Afrikaner, Khmer Krom, Oromo, District of Columbia and Brittany. Un communiqué de presse (en francais) sur l'AG est disponible sur le site de l'Agence Bretagne Presse.